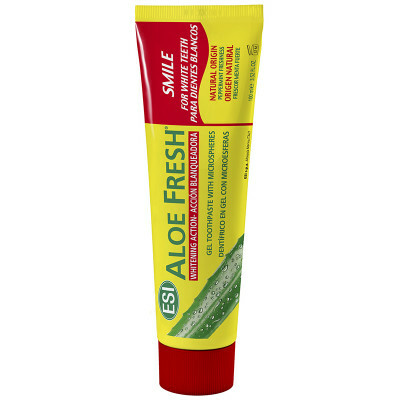 A naturally derived gel toothpaste to keep your pearlers squeaky clean and noticeably lighter With an extended release action though this Aloe Fresh Toothpaste will also strengthen gums and combat bad breath. Aloe Barbadensis Leaf Juice, Sorbitol, Aqua Hydrated Silica, Xylitol, Glycerin, Tripotassium Citrate, Sodium Lauroyl Sarcosinate*, Xanthan Gum, Menthol, Sodium Benzoate, Potassium Sorbate, Mentha Viridis Extract, Cetraria Islandica Extract, Tilia Cordata Extract, Aesculus Hippocastanum Extract, Ammonium Glycyrrhizate, Mentha Viridis (Spearmint) Oil, Melaleuca Alternifolia (tea Tree) Oil, Chlorophyll, Helianthus Annuus (Sunflower) Seed Oil, Keratin, Chromium Oxide Green, Chroma-lite Yellow, Bha, Gelatin, Acacia Senegal Gum, Cellulose Gum, Citric Acid. Of all of the natural toothpaste that i have tried this one is right up in my top 5. it foams similar to normal toothpaste and leaves your mouth feeling fresh and minty. The best toothpaste so far. Fresh. Less minty than its brothers. Gel. Foam well. We've been looking for another minty toothpaste since Spry was removed and loving this one. It's minty and leaves your mouth feeling nice and fresh. Our new favourite.